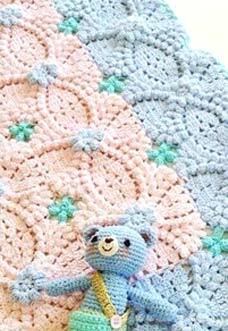 Awesome handmade pretty crochet baby blanket is a great gift to a kid. At Mycrochetpattern you can find easy to understand training on how to crochet this cozy blanket, techniques used, necessary thread and hooks and video guide for this crochet pattern. You can download a printable instruction in PDF format for free at the end of the lesson. We even made a research to find the best deals of yarn, hooks and other important materials and accessories in the web. Begin with a Magic Circle, 1 ch. Row 1: 5 ch, *1 dc into circle, 2 ch, rep from * 6 times, sl st.
Row 2: 3 ch, 4 hdc popcorn into arch, 3 ch, *5 hdc popcorn into arch, 3 ch, rep from * 6 times, sl st.
Row 3: 2 sl st, *3 ch (cost as 1 dc), 2 dc into arch, 3 ch, 5 hdc popcorn into arch, 3 ch, 5 hdc popcorn into same arch, 3 ch, rep from * 3 times, sl st.
Row 4: *3 ch (cost as 1 dc), 1 dc into 1st ch, 1 dc into next dc, 2 dc shell into next dc, 3 ch, 5 hdc popcorn into arch, 5 ch, 5 hdc popcorn into same arch, 3 ch, rep from * 3 times, sl st.
Row 5: *3 ch (cost as 1 dc), 1 dc into 1st ch, 1 dc into next dc, ch, skip 1 dc, 1 dc into next dc, 2 dc shell into next dc, 3 ch, 5 hdc popcorn into arch, 3 ch, 5 hdc popcorn into same arch, 3 ch, 5 hdc popcorn into same arch, 3 ch, rep from * 3 times, sl st.
Row 6: *3 ch (cost as 1 dc), 1 dc into 1st ch, 2 dc into next 2 dc, ch, skip 1 dc, 2 dc into next 2 dc, 2 dc shell into next dc, 3 ch, 5 hdc popcorn into arch, 3 ch, 5 hdc popcorn into same arch, 3 ch, 5 hdc popcorn into next arch, 3 ch, 5 hdc popcorn into same arch, 3 ch, rep from * 3 times, sl st.
Row 7: *3 ch (cost as 1 dc), 2 dc tog, 3 ch, 3 dc tog, 3 ch, 3 dc tog, 3 ch, 3 ch, 5 hdc popcorn into arch, 3 ch, 5 hdc popcorn into same arch, 3 ch, 5 hdc popcorn into next arch, 3 ch, 5 hdc popcorn into same arch, 3 ch, 5 hdc popcorn into next arch, 3 ch, 5 hdc popcorn into same arch, 3 ch, rep from * 3 times, sl st.